We all know how our feet can get. As well as feet being a body part that takes quite a battering anyway, men’s feet are more prone to the build up of dead skin that can be difficult to remove. Using files and buffers will help, but it’s about previsions rather than an all our abrasive assault. Here is my guid to leaving them clean, smooth and soft. This is a solid sugar scrub from Lush, called Australian Igloo. This is my favourite but they do have quite an extensive range. They come in a lump in a bag and you just need to crack off the amount you need and then stick the rest back in the bag. 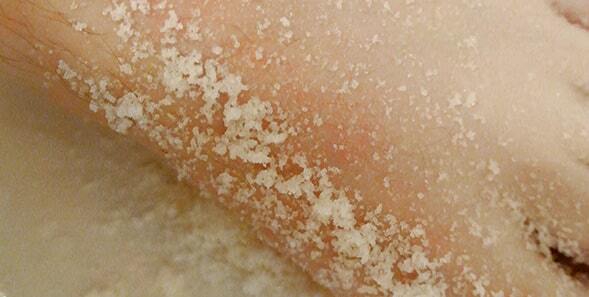 Making sure your feet are damp, press the lump of sugar scrub into the skin and then proceed to vigorously massage. Get both the tops and bottoms of the feet as well as in-between the toes then simply rinse off. 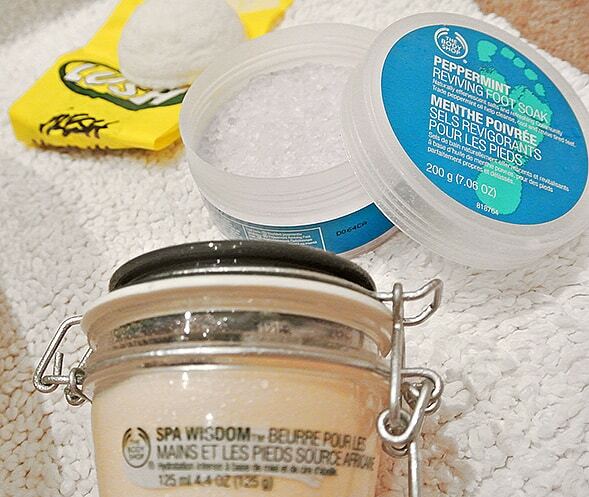 The Body Shop’s Peppermint Reviving Foot Soak is amazing. It cools and softens intensely whilst leaving them invigoratingly fresh. The trick is the softening properties of the Community Trade Peppermint oil produced right here in England. It’s recommended that you use it with warm water, but particularly in this weather we’ve been having, shove it in some cold, it’s brilliant! Pour a small amount of the soak into your foot spa. I’ve been using the Champney’s massage and bubble foot spa. I like it because it’s grey and not pink or purple and pretty manly as far as foot spas go. It gives great bubbles as well as a pretty powerful vibrating massage. There is a panel on the top of the device that’s actually an IR heating plate, so when you’ve taken your feat out, pop them on there, one at a time, and let them dry. 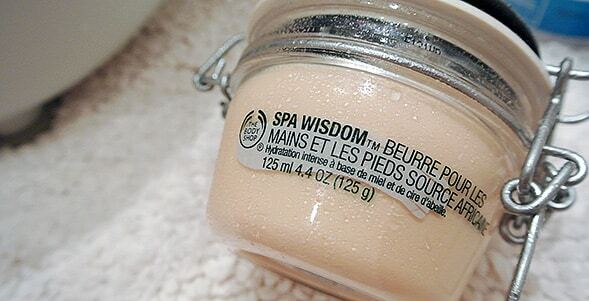 Another The Body Shop favourite, the Spa Wisdom Hand and Foot Butter. This is the older version with the older packaging, but I love the new version just as much. The product contains honey and beeswax which will both moisturise and protect. Slap on and massage in. The thing I love so much about this is how quickly it soaks in. That’s it really. This will ensure that skin cell turnover on the feet is regulated so will help to shift dry pads or if you haven’t got them, it’ll help stop them appearing. It’s a pretty easy process and can take 10 minutes or more, it totally depends on how long you want your feet in your foot spa. I’ve been doing it on a Wednesday during BBC’s The Apprentice as the ritual calms me down sufficiently when faced with pangs of violence against the contestants. This article first appeared on MANFACE written by Thom Watson. It was published on Thursday 24th May 2012 and was last updated on Monday 3rd April 2017 at 4:20pm. It's categorised under Body, Feet, LUSH Ltd, The Body Shop where you'll find more related content.